Last year I traveled to a U.S.-based conference, the first time I’ve done so since moving back to Canada. It’s easy for Americans to forget that Canadians routinely use the metric system every day (gasoline in litres, road trips in kilometers, and temperature in degrees Celsius). An American business traveler high up in a Vancouver hotel looks out one morning, sees nothing but clouds. He calls the front desk and asks about the weather. Reference job aids like this aren’t geared to a specific task the way worksheets or procedure job aids are. 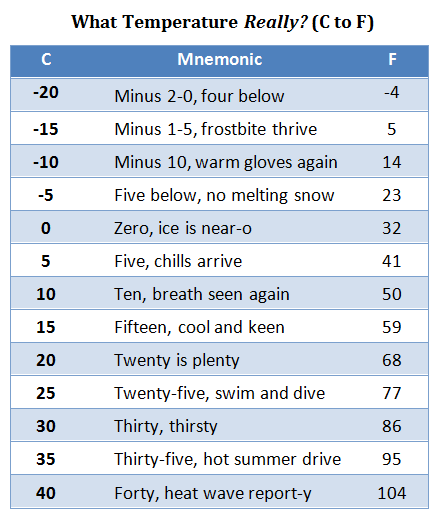 This is a way to organize information so someone who has a general idea of today’s temperature in degrees Fahrenheit can figure out the Celsius equivalent. Who’s referring to this, and why? As Thomas and Marilyn Gilbert pointed out, when it comes to weather people don’t want to solve a mathematical equation; they want to know if they need a jacket. Explaining Celsius to Fahrenheit users, the Gilberts gave examples like 20 is plenty (“room temperature,” 68° F) and 30 is thirsty (“a thirsty hot summer day in New York,” 86° F). The audience I had in mind was Celsius users attending a conference in Las Vegas. I wanted to offer a quick way to figure out the approximate temperature. Most of the time, in most of the U.S., a Fahrenheit range of 0 to 100 covers any temperature they’ll run into. Anything off the chart is way too cold or, as you see, too damned hot. If you want, you can read right-to-left on the chart to see what 27° Fahrenheit is in Celsius. That’s less than optimal, I think. Typically we don’t read in that direction, and the examples in Fahrenheit aren’t as easily read as those in Celsius. 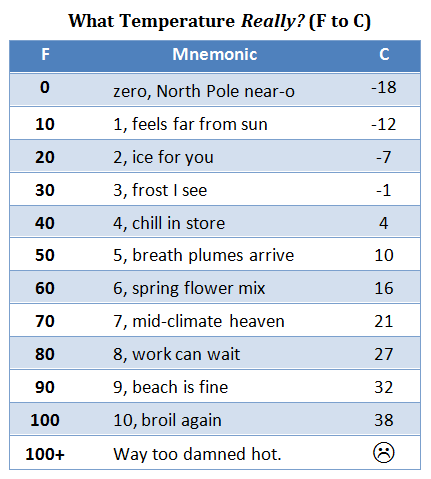 You’ve noticed the mnemonics in the chart; three of them in the C-to-F version came directly from the Gilberts. From a pure-reference viewpoint, they’re unnecessary, but as an aid to recall they offer a lot of potential. I’ll return to that concept, along with some design-for-reference ideas, in a future post.